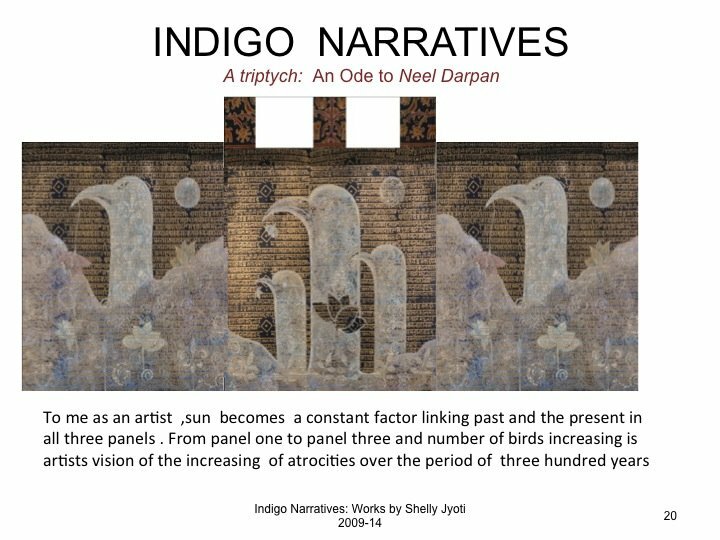 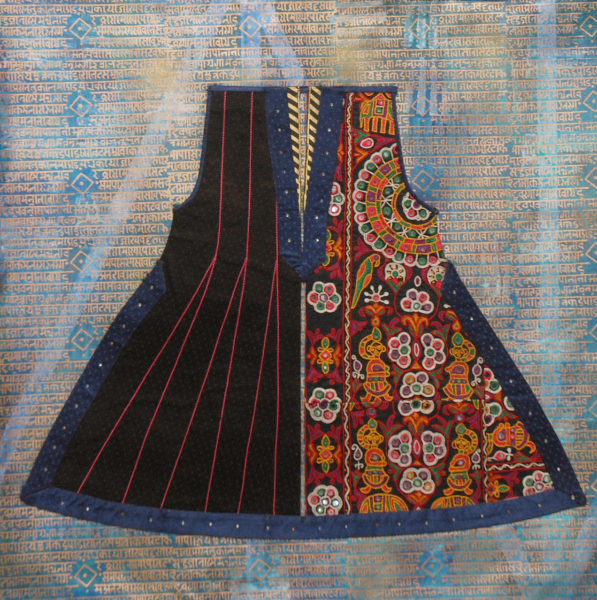 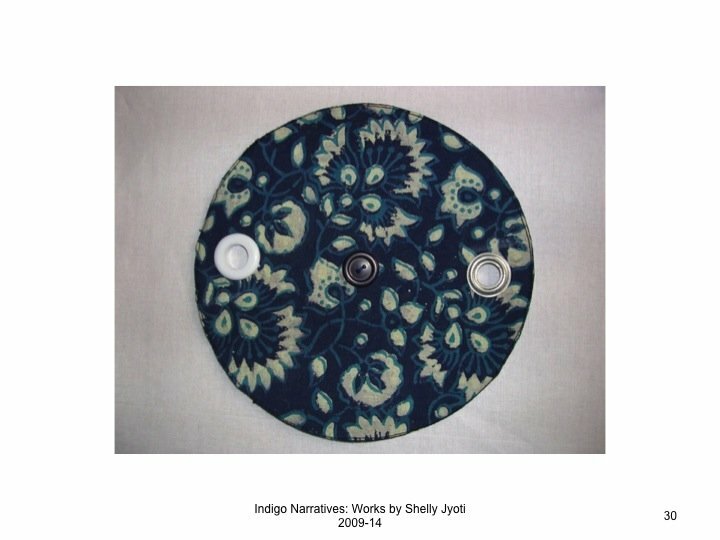 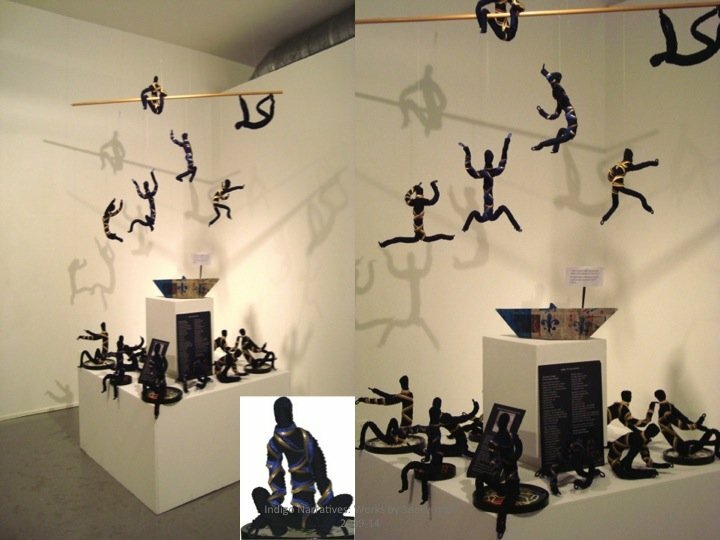 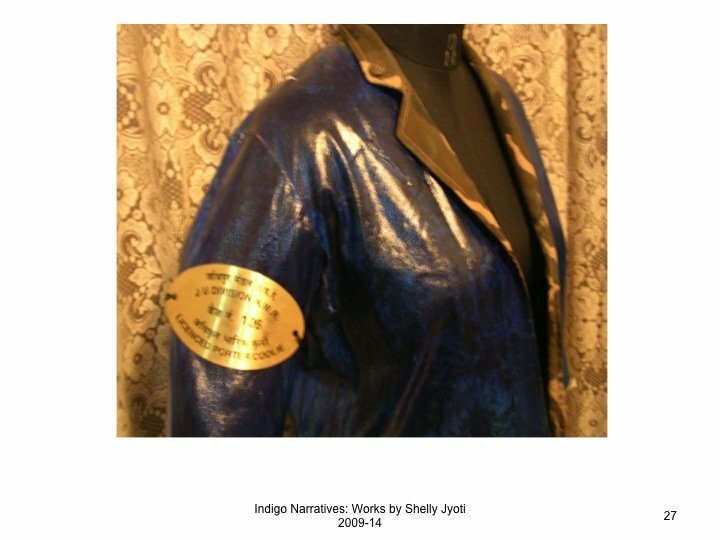 Indigo: New works by Shelly Jyoti and Laura Kina. 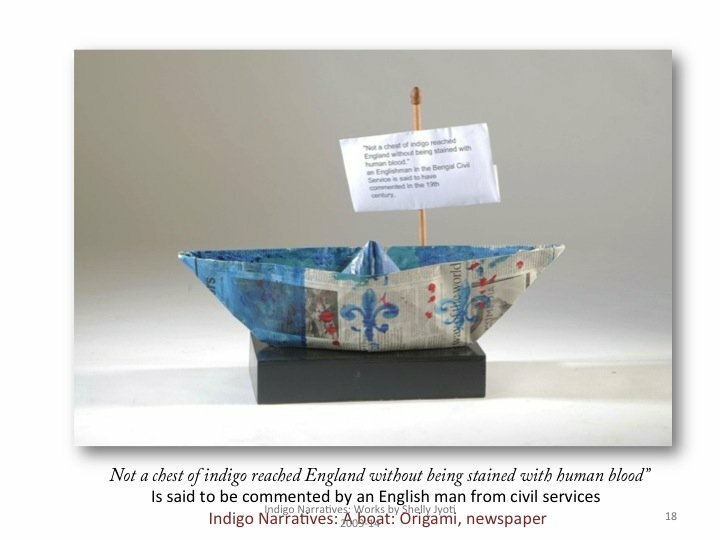 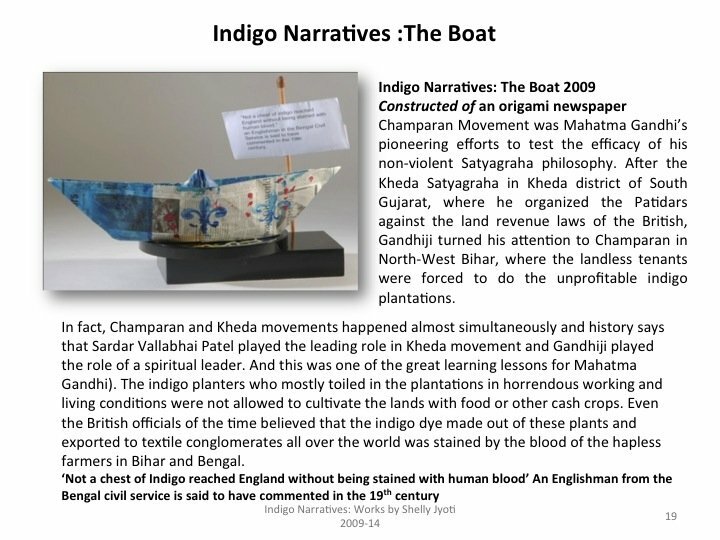 “Not a chest of indigo reached England without being stained with human blood”, an Englishman in the Bengal Civil Service is said to have commented. 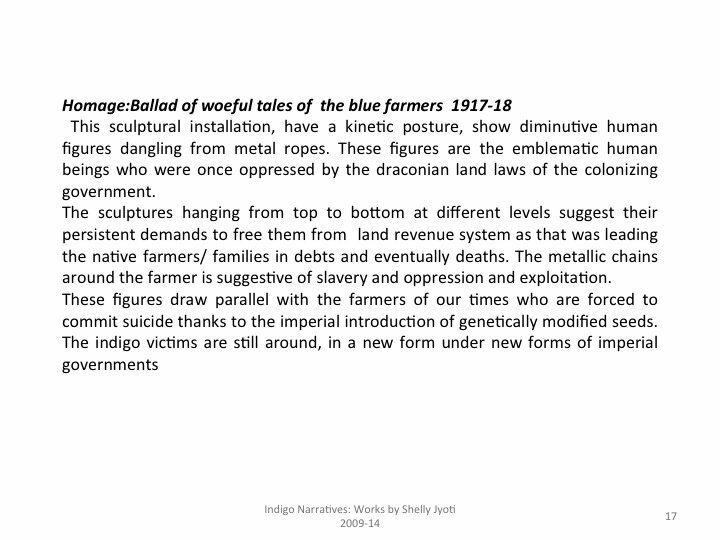 In the 19th century, Bengal was the world’s biggest producer of indigo but today, the deep blue color of indigo is synthetically created in a lab and is associated, in the West, with blue jeans more than its torrid colonial past. 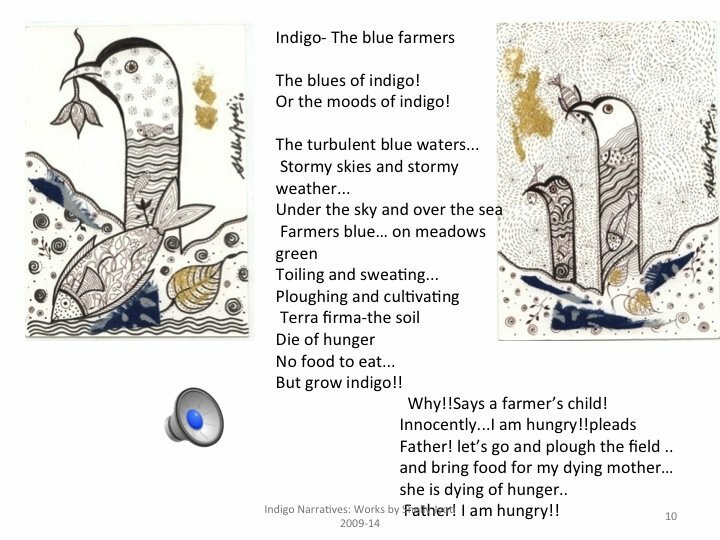 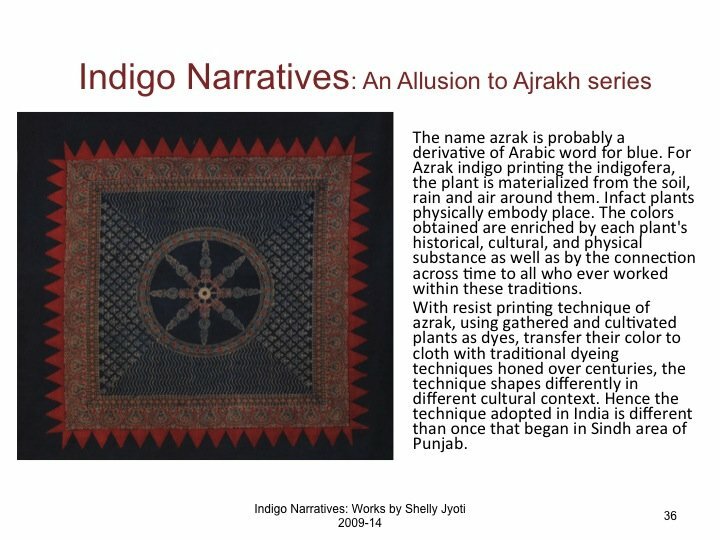 But indigo holds a sustained presence in the post-colonial identity of India. 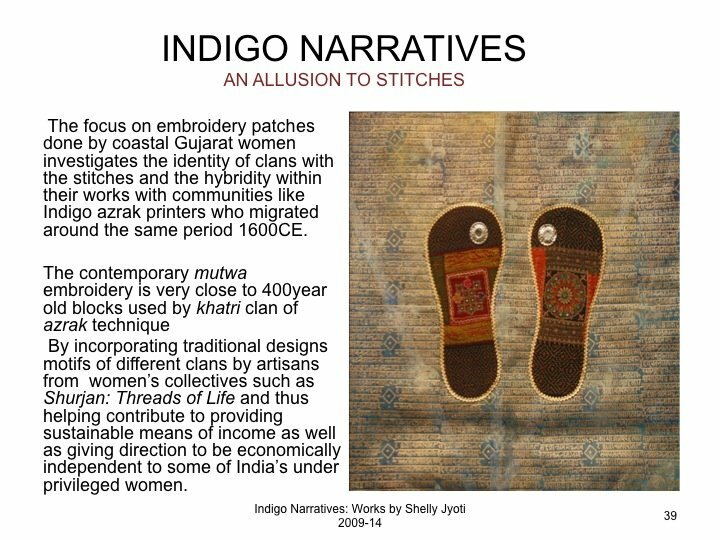 Employing fair trade embroidery artisans from women’s collectives in India and executing their works in indigo blue, Indian artist SHELLY JYOTI and US artist LAURA KINA’S new works draw upon India’s history, narratives of immigration and transnational economic interchanges in the exhibition titled Shelly Jyoti and Laura Kina decided to collaborate in 2008-2009, considering their mutual interest in textile history, pattern & decoration. 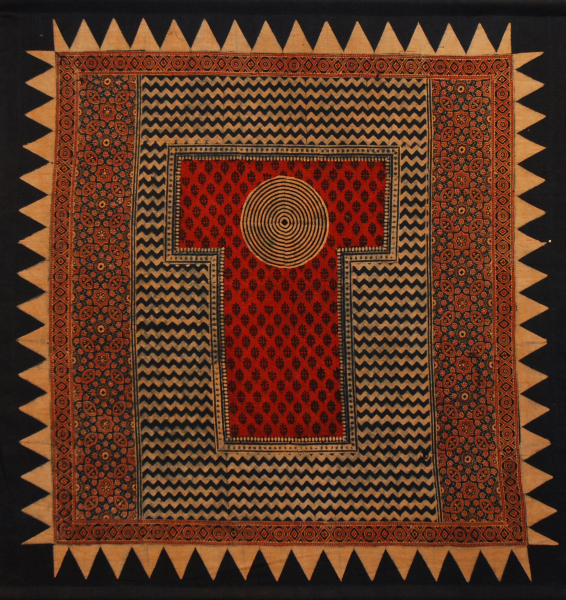 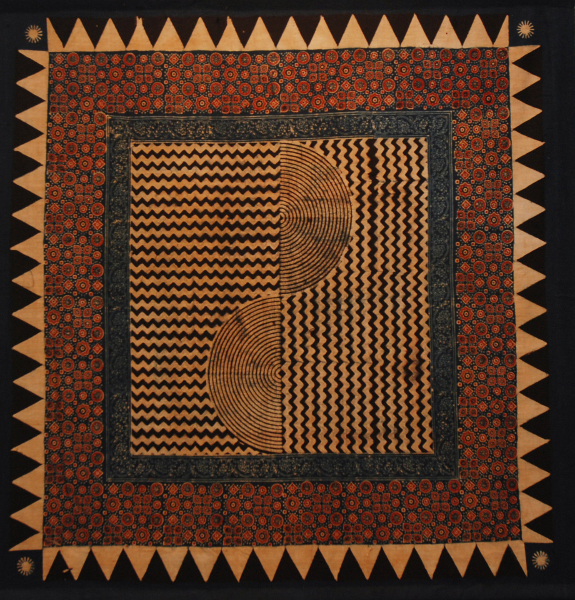 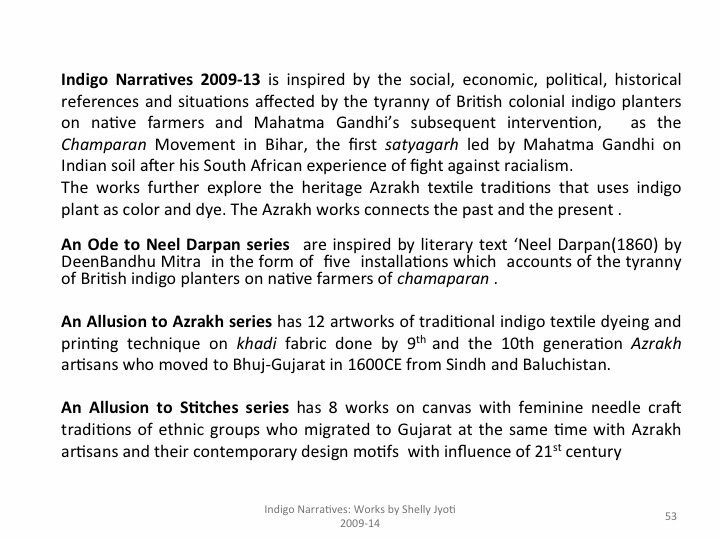 They began by thinking about the intersections of their own ethnic and national positions in relation to fabrics. 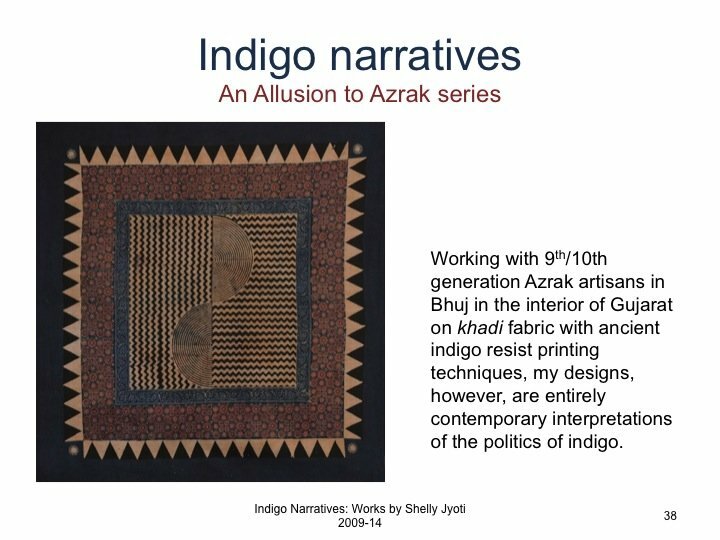 For this exhibition in particular,Shelly Jyoti’s Indigo Narratives utilize traditional embroidery and embellishments along with heritage symbols belonging to traveling ethnic communities who settled in coastal Gujarat while Laura Kina’s Devon Avenue Sampler series focuses on visual images from a contemporary Desi/Jewish community in Chicago, IL. 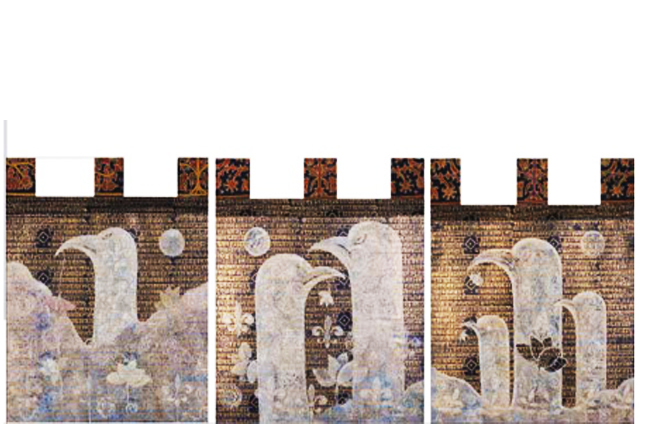 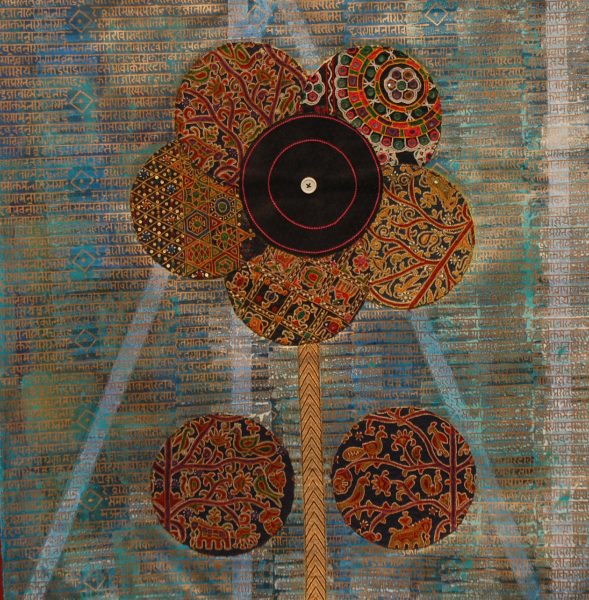 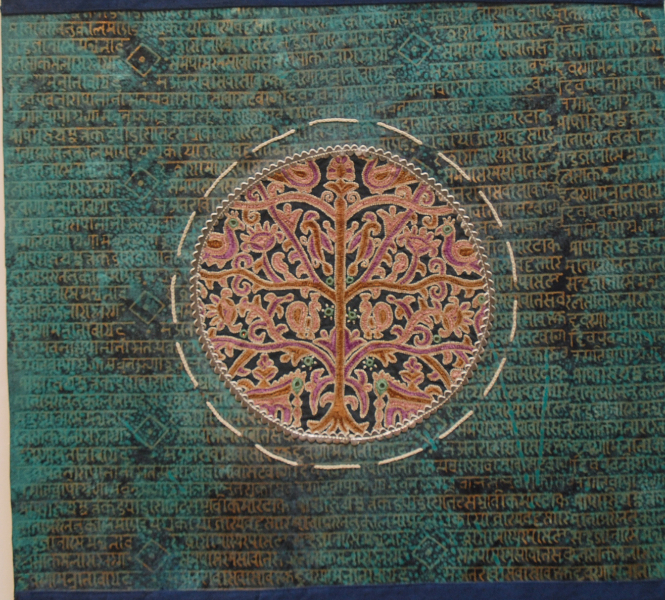 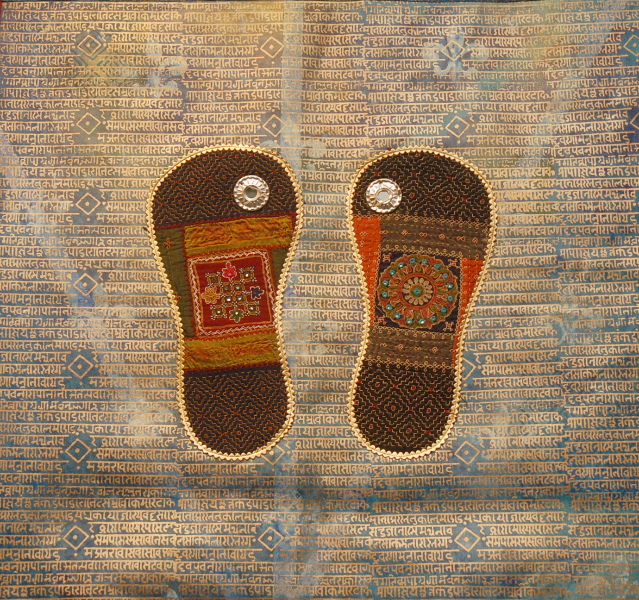 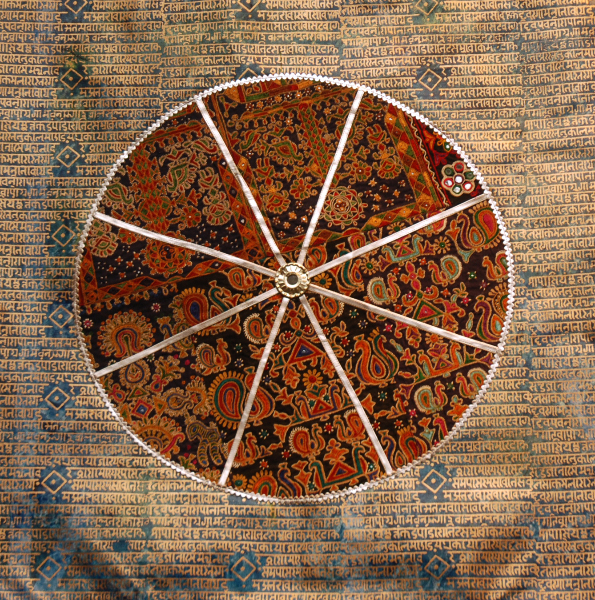 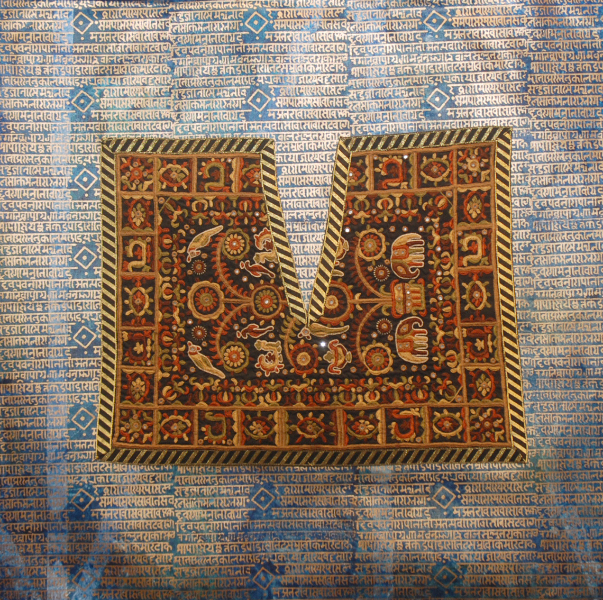 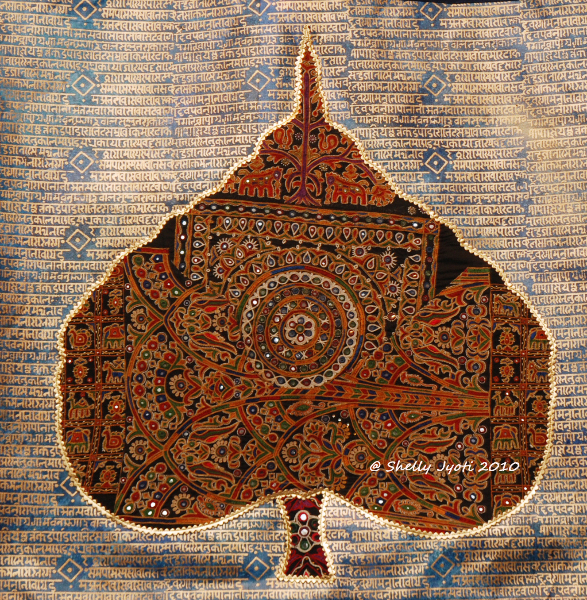 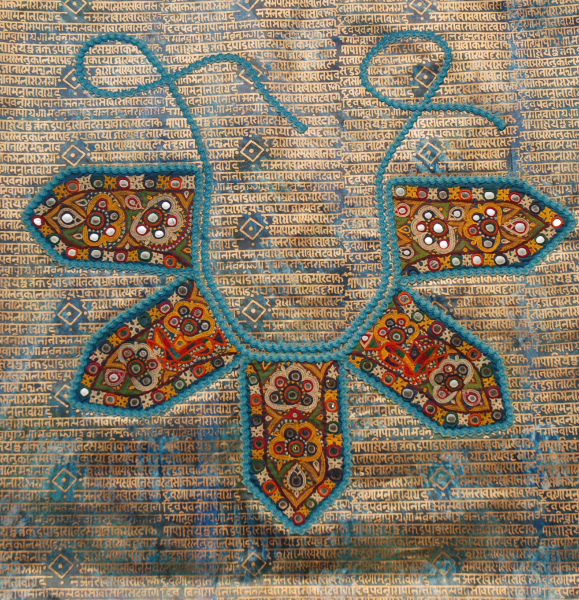 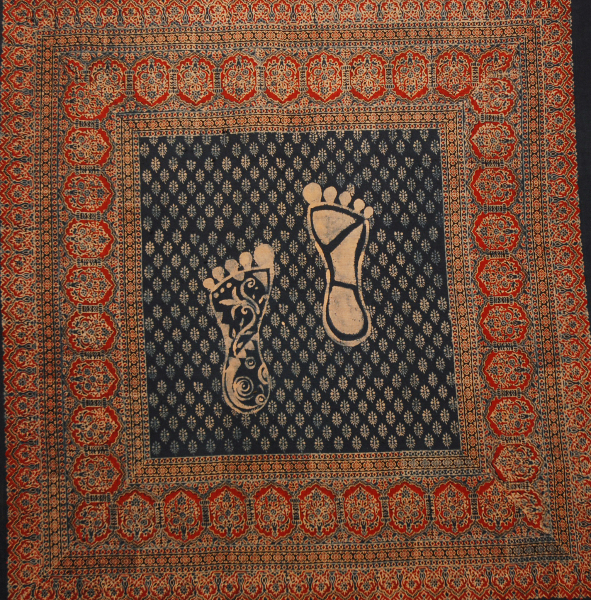 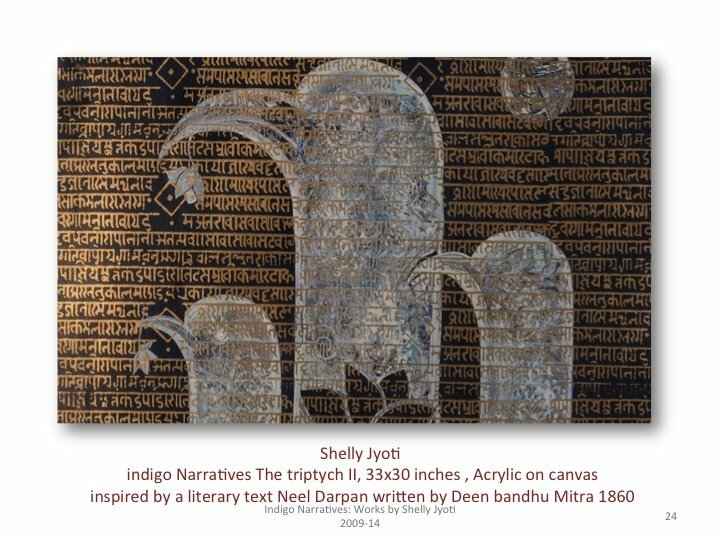 The exhibition comprises of around forty new works (including five site specific installations) in mediums like hand embroidery on khadi, acrylic on fabric, hand stenciled Sanskrit calligraphy and textile embroidery on canvas. 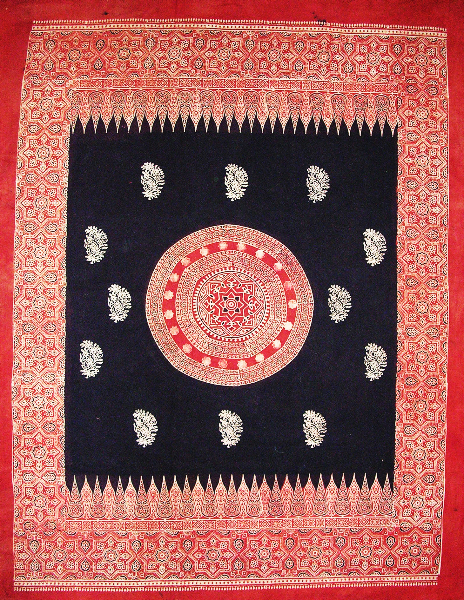 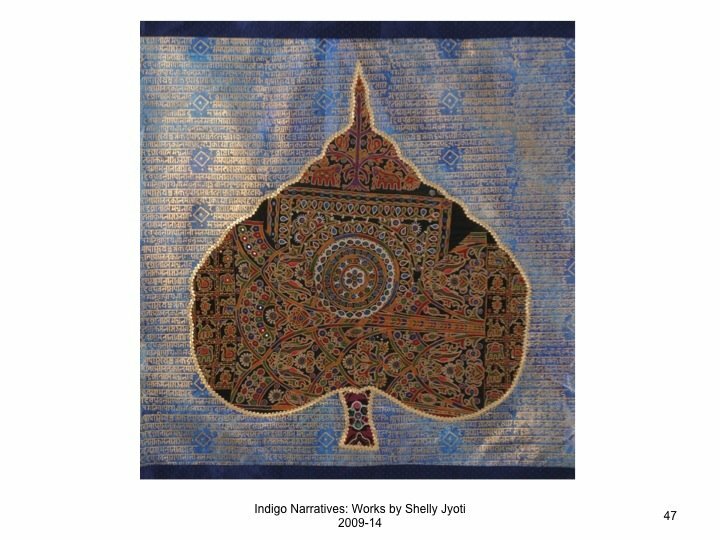 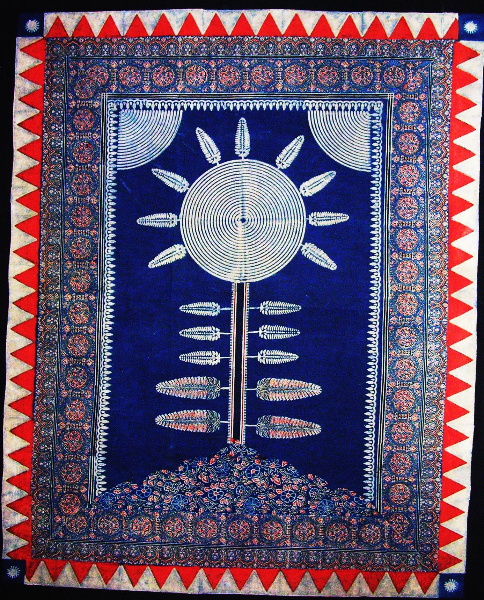 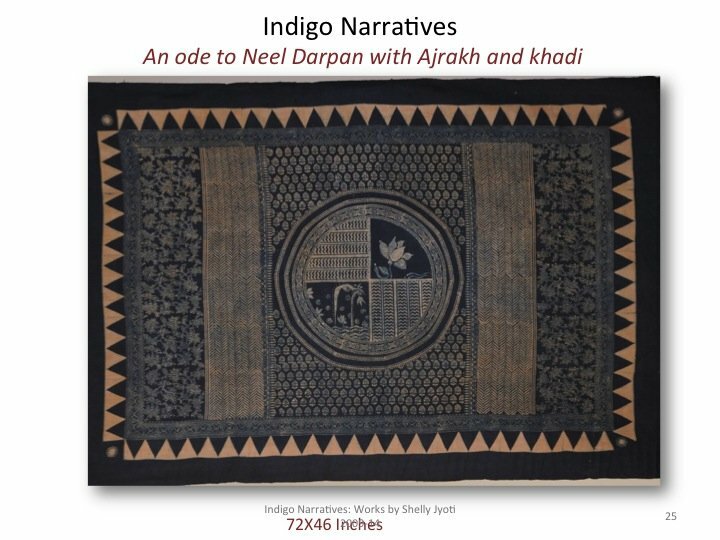 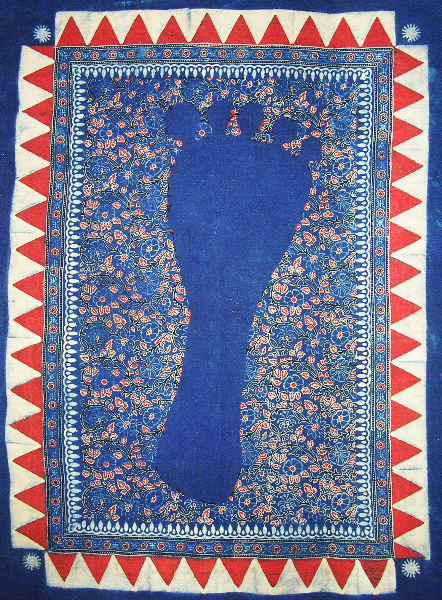 Shelly Jyoti’s Indigo Narratives use indigo color vegetable dyes, traditional heritage symbols of Sanskrit calligraphy, and hand embroidery of the coastal Gujarat region. 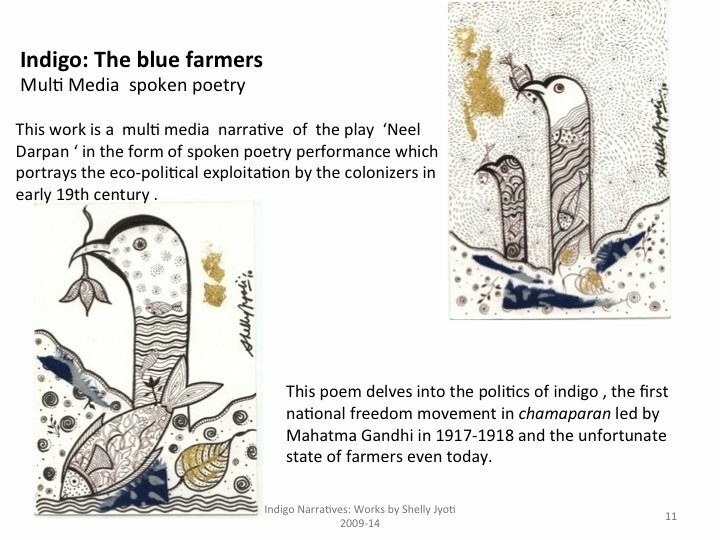 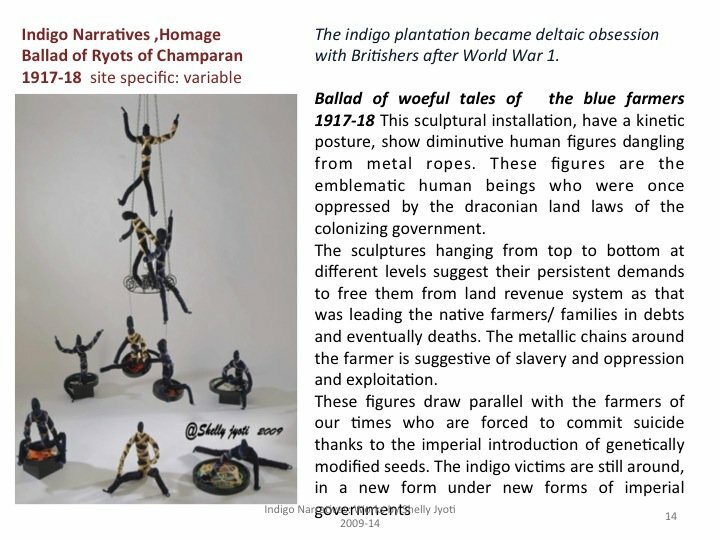 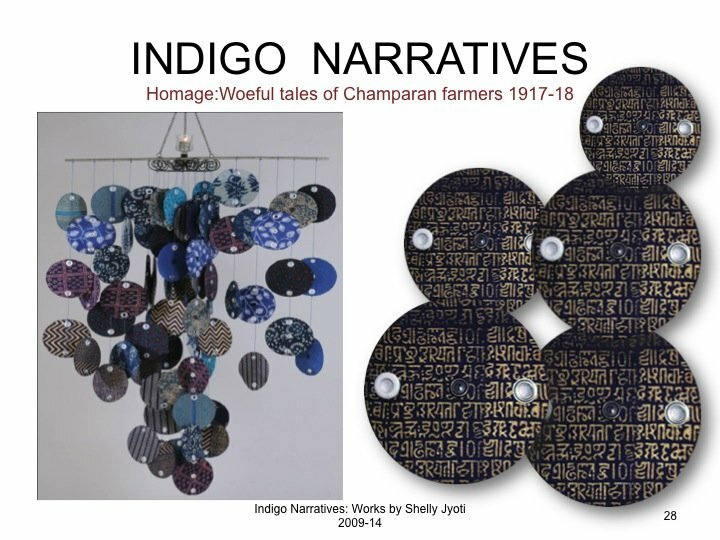 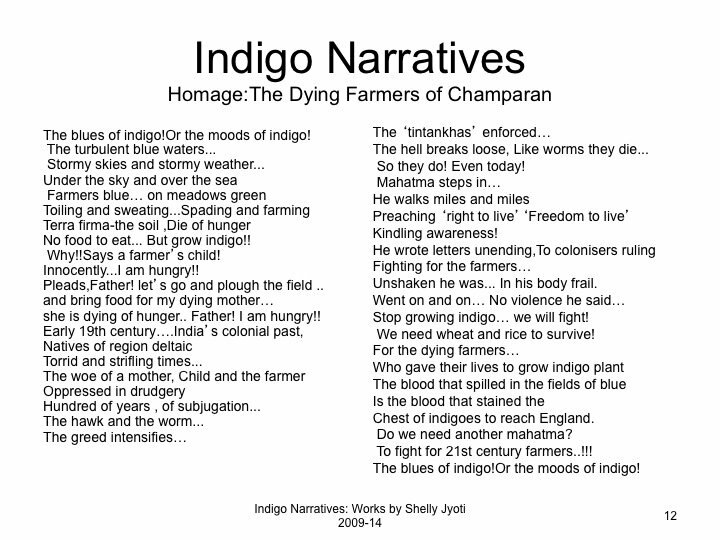 Her narratives are inspired by the social, economic and political situations affected by the tyranny of British colonial indigo planters on native farmers and Mahatma Gandhi’s subsequent intervention, the Champaran Movement in Bihar. 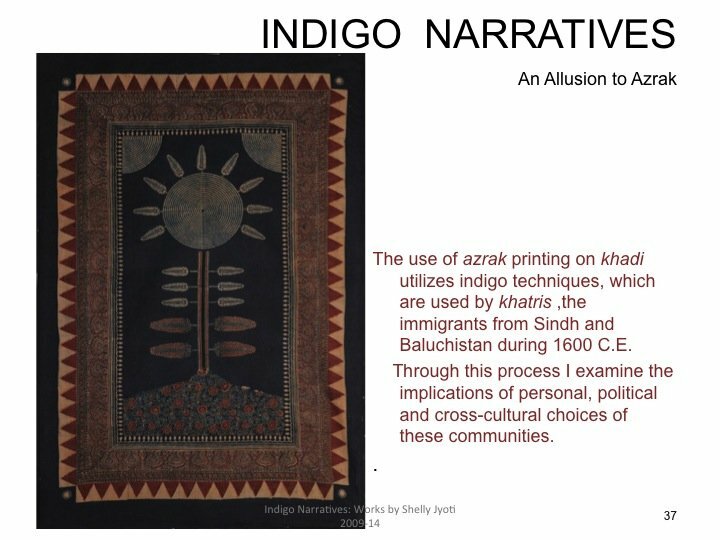 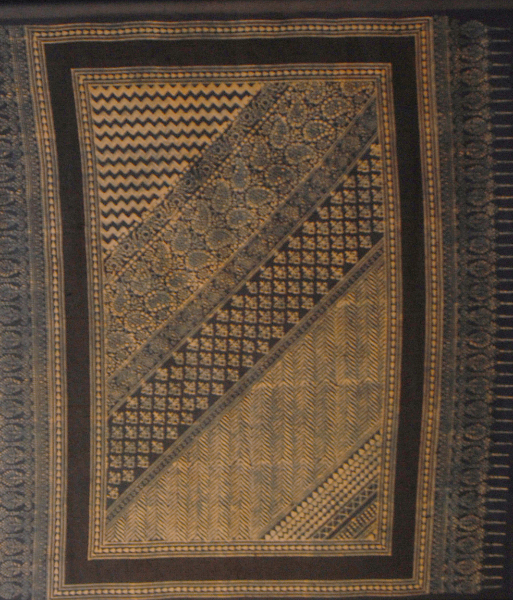 Her choice of tribal embroidery is equally strategic as it interconnects different communities ethnically and culturally. 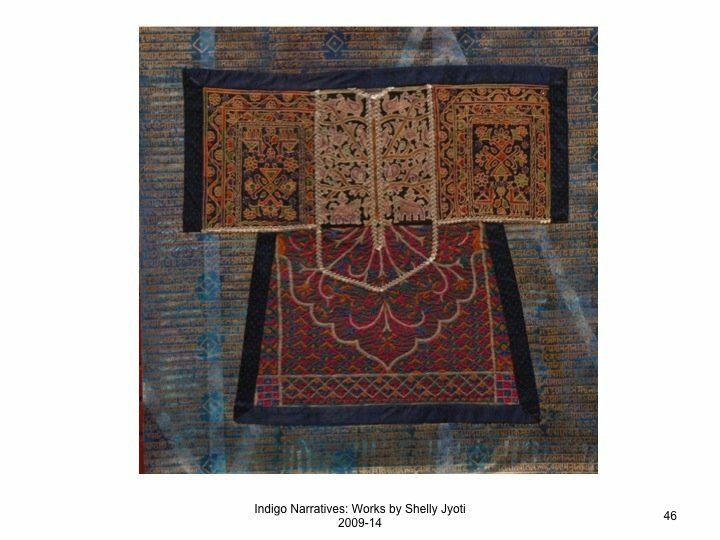 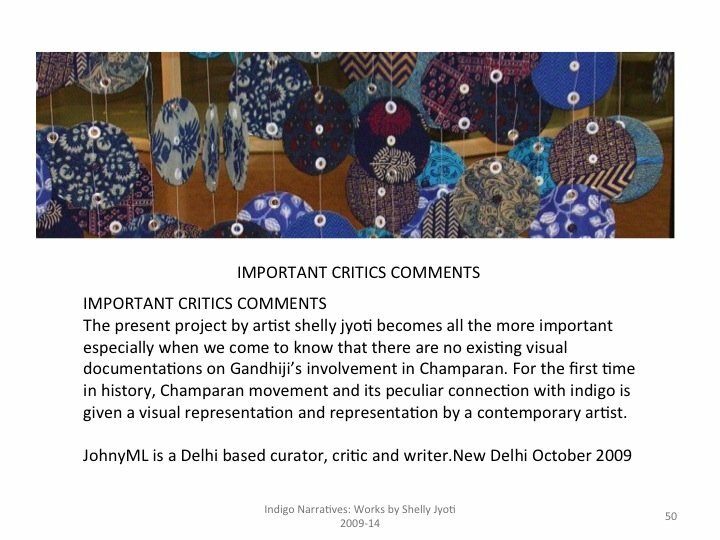 Shelly Jyoti, a visual artist, fashion designer, poet, researcher and an independent curator, lives and works in Vadodara, India. 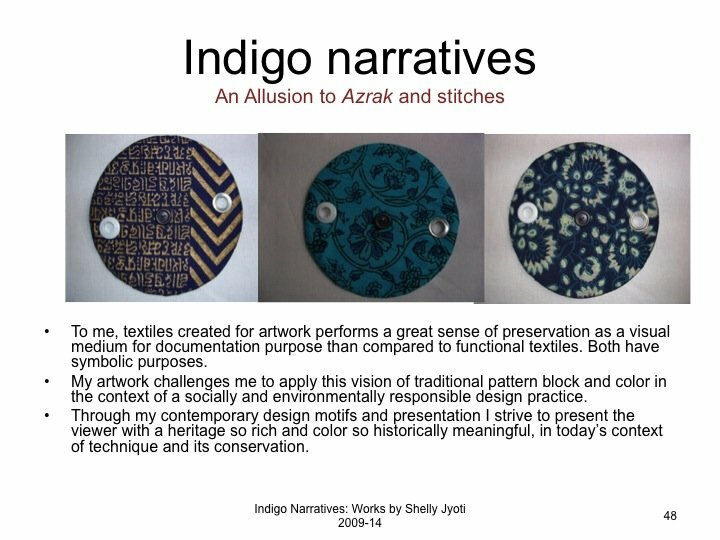 She is trained in fashion design and clothing technology at the National Institute of Fashion Technology, New Delhi and has completed her Masters degree in English Literature from Punjab University in Chandigarh. 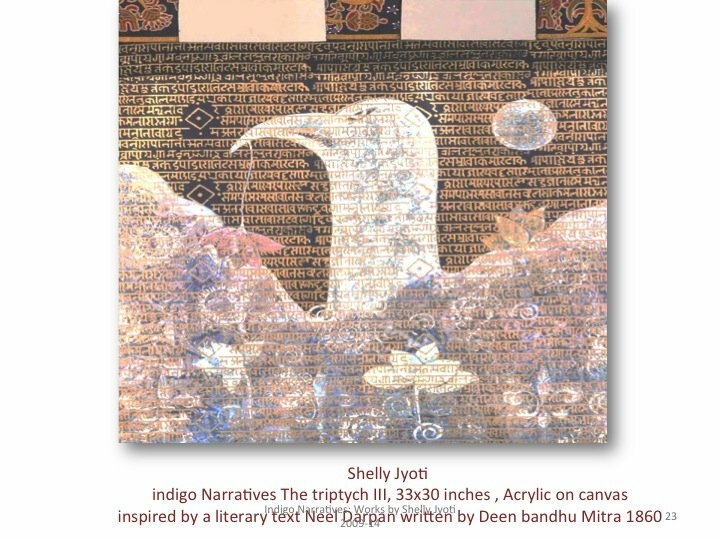 Her writings and paintings have been published internationally. 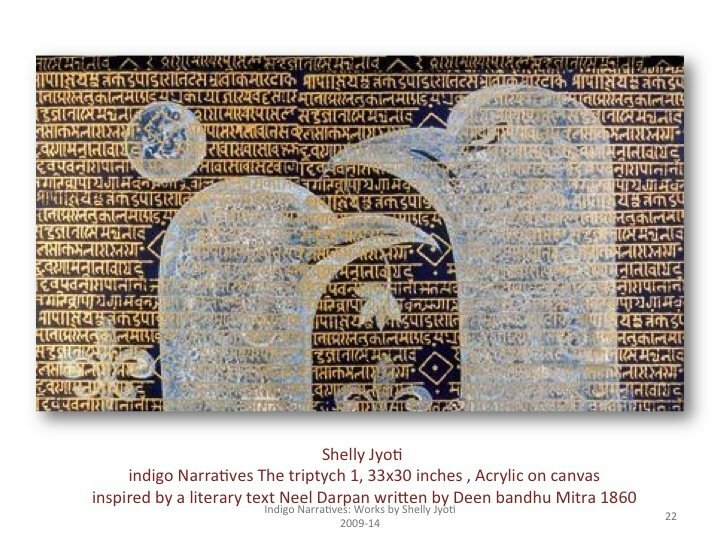 Her works are in collection with Sahitya Akademi, the journal of Indian English literature. 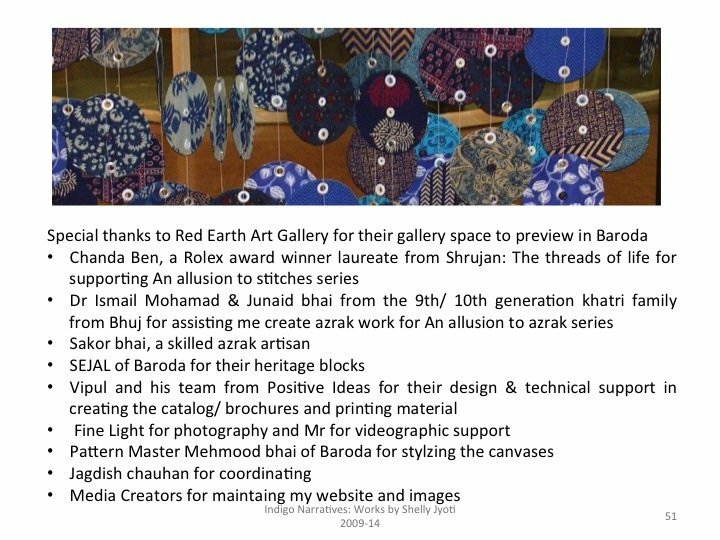 She is an advisory board member of Disha, a non-profit organizations dedicated to helping children with autism, and Socleen, a non-profit environmental organization. 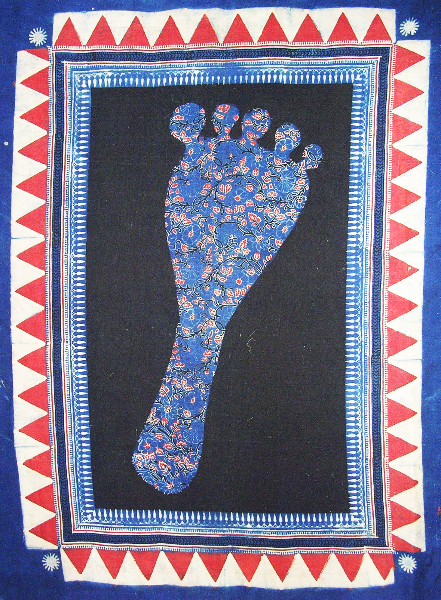 Created using indigo dye and khadi fabric (two materials long associated with Mahatma Gandhi and symbolic of India’s Freedom Movement from British colonization), and a generous dose of Gujarat-style mirrored bling and Jewish tzitzit inspired tassels, her samplings of Chicago’s Devon Ave. poly-cultural street signs have been hand embroidered by artisans from MarketPlace: Handwork of India, a fair trade women’s collective based in Mumbai. 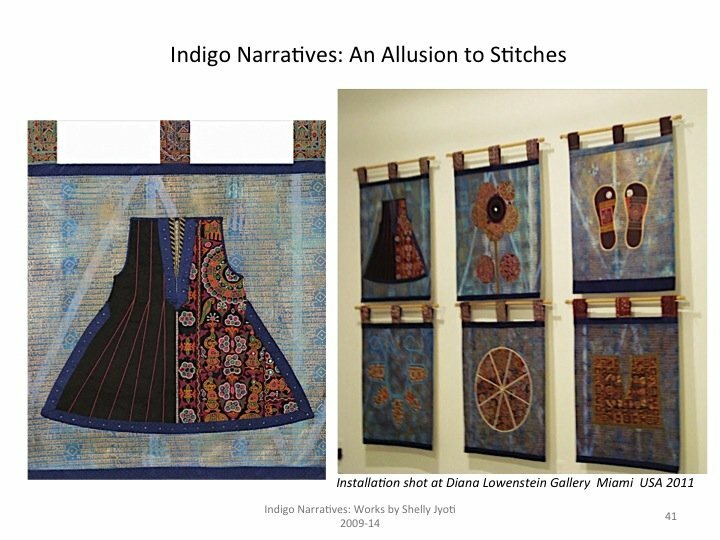 The use of the word the word “sampler” in the series title refers to embroidery samplers and “sampling” as in cultural appropriation. 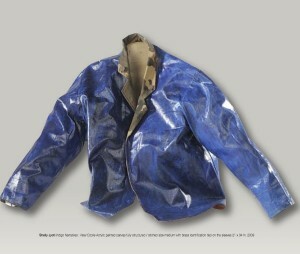 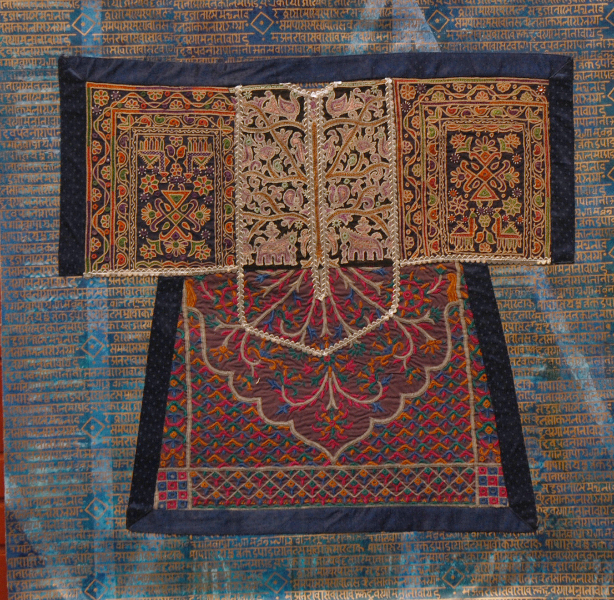 Kina’s work raises issues of labor, authenticity, and positionality. 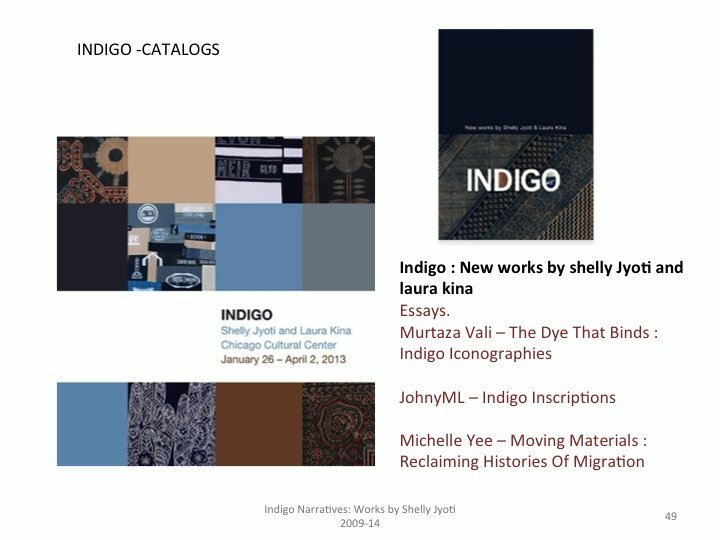 Laura Kina is an artist and scholar living in Chicago, IL. 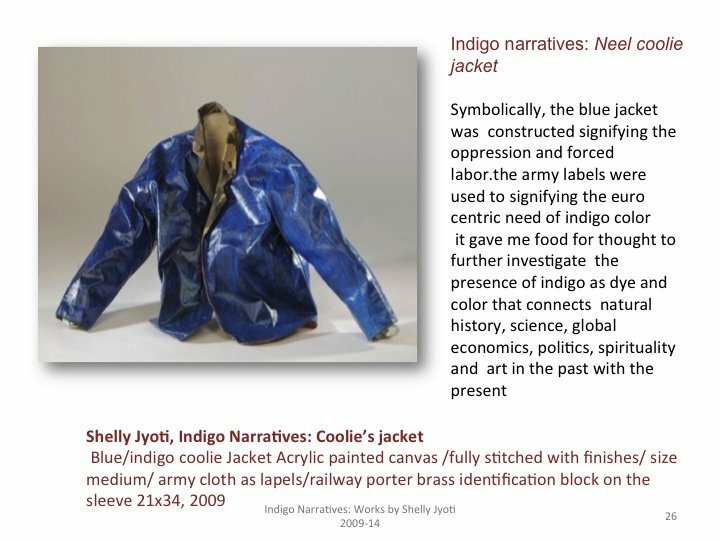 She is an Associate Professor of Art, Media and Design, Vincent de Paul Professor, and Director of Asian American Studies at DePaul University. 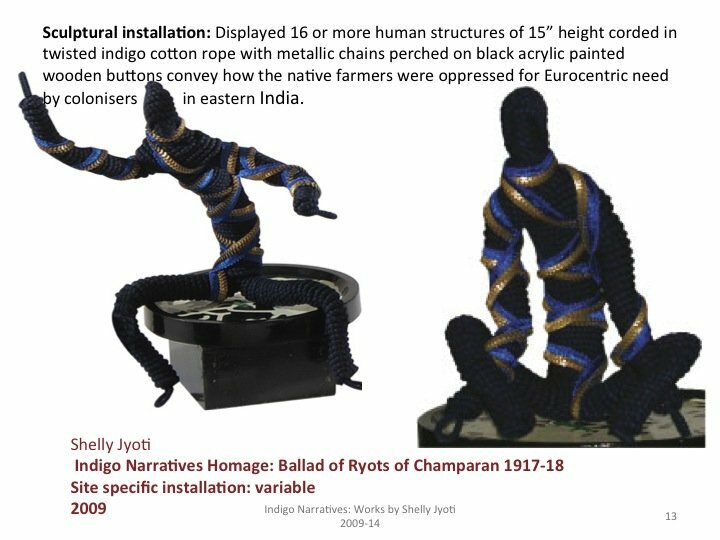 She earned her MFA from the University of Illinois at Chicago and her BFA from the School of the Art Institute of Chicago. 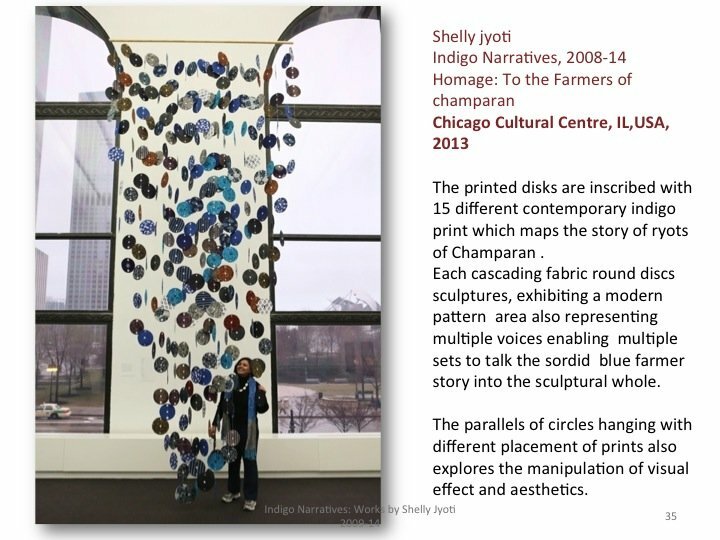 She is a 2009-2010 DePaul University Humanities Fellow. 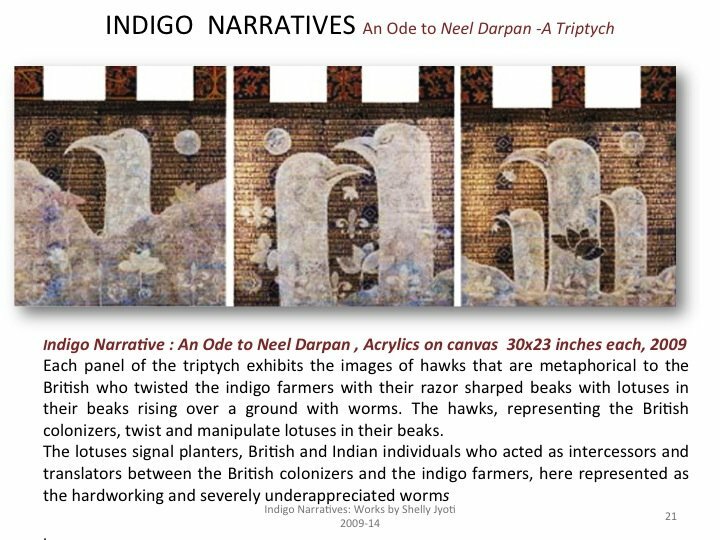 Her Devon Avenue Sampler series is funded in part by the College of Liberal Arts & Sciences and a University Research Council Grant from DePaul University. 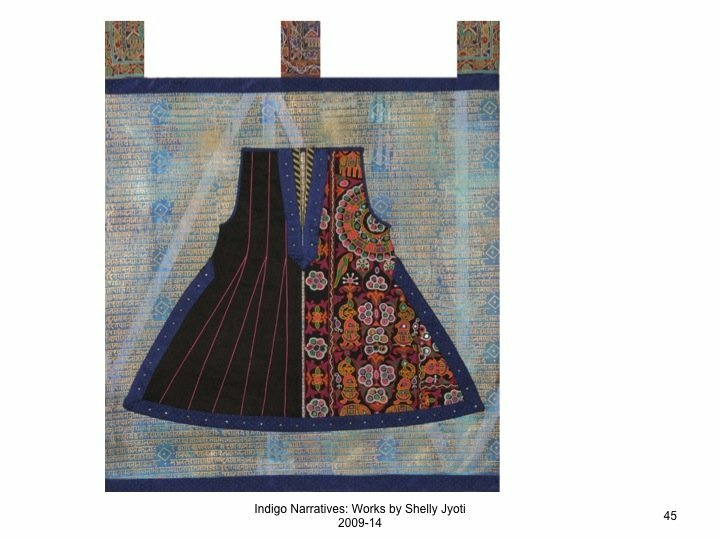 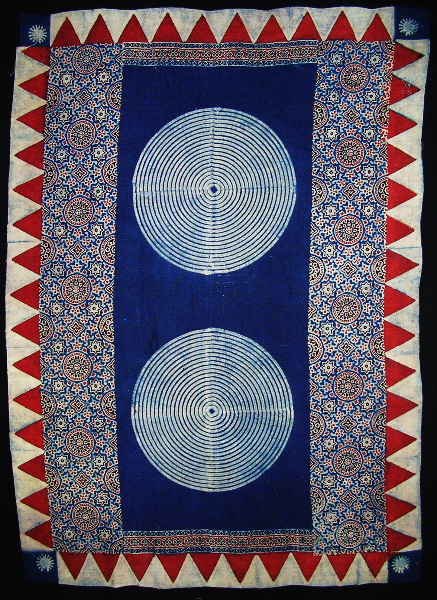 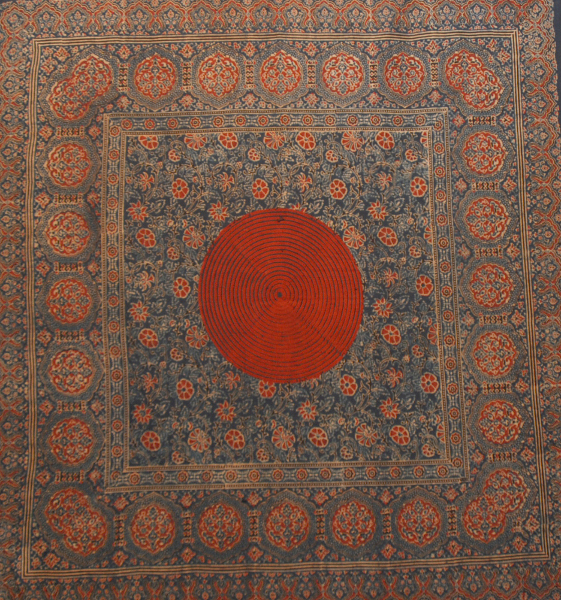 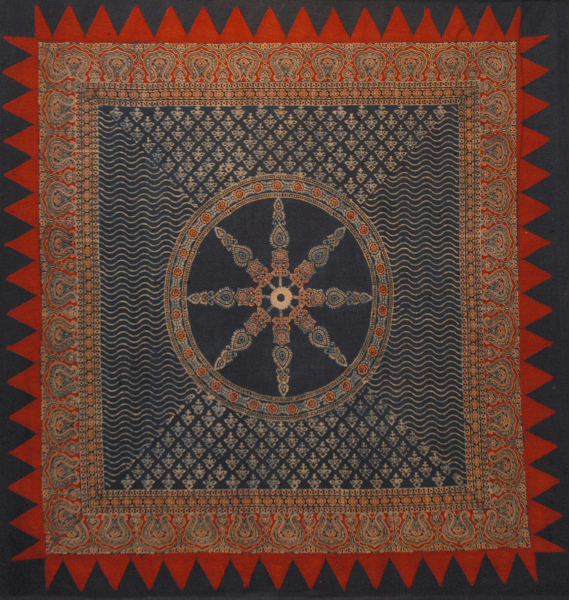 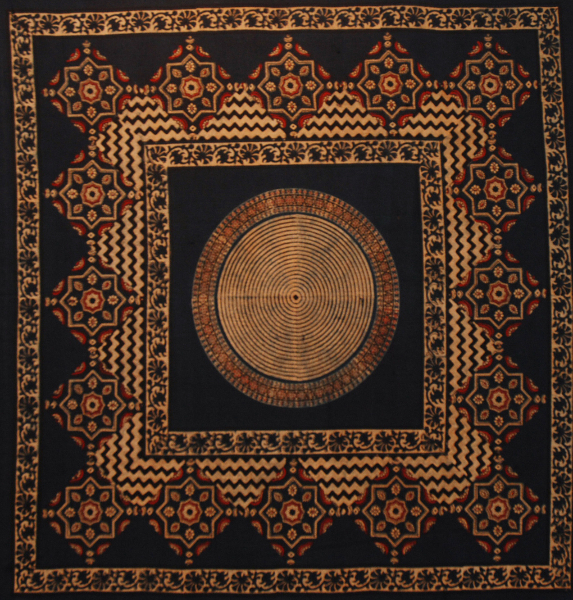 The exhibition is a must-see as it throws light on the history of indigo, from its torrid colonial past in India to the indigo-dyed Japanese folk kasuri fabrics, from boro patchwork quilts and the working class blue jeans in the United States to the blue threads of a Jewish prayer tallis! 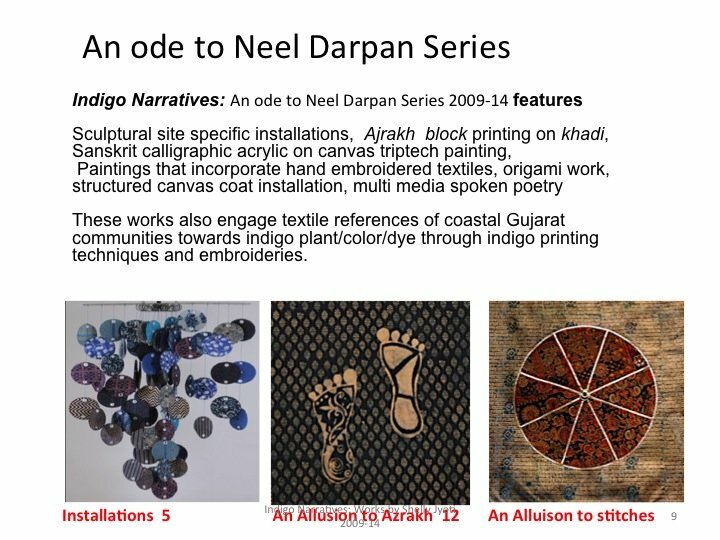 12 -18 January, 2010 Nehru Center Worli, Mumbai India.